(Photo Courtesy/Mike Beiermeister) Community risk reduction officer Andy Marceau and Alpena County 911 director Burt Francisco talk about different safety tools for seniors on Thursday. Alpena, Mich. — Carbon monoxide and smoke detectors, fire alarms, and escape plans are all important tools in keeping yourself as well as friends and family safe. On Thursday, seniors got a refresher on some important safety tips and information. 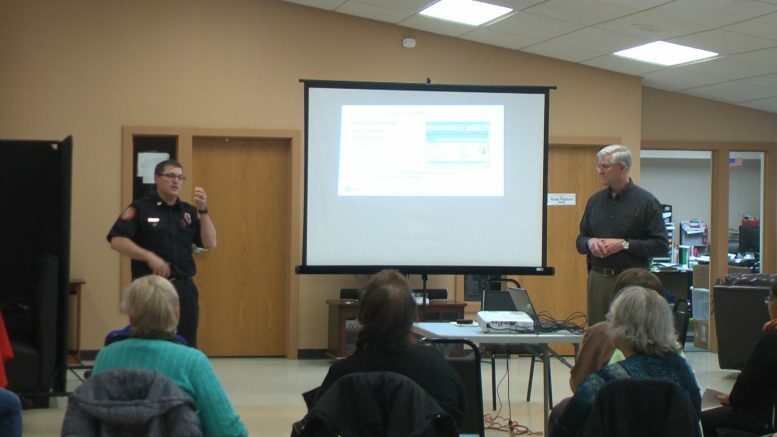 Alpena City Fire Department community risk reduction officer Andy Marceau and 911 director Burt Francisco presented lifesaving tips, so that seniors can be ready, should an emergency arise. Both provided a few useful tools for seniors to protect themselves with. Two of those were carbon monoxide and smoke detectors that seniors can get help with installation by contacting the senior center. The other was a smart 911 app, where you can preload information like photographs, allergies, and other important notes about where you live and who lives there. This helps first responders have a better understanding when responding to a situation. They can look at the information, so they can anticipate an emergency instead of going in with little or no details. Smart 911 is free and available in the app form or via website for all Michiganders. It can be extremely helpful in nonverbal communications as well. The technology is four years old and was introduced two years ago. It has seen a large increase in enrollment over the past year. You can fill in your information by visiting the website www.smart911.com.